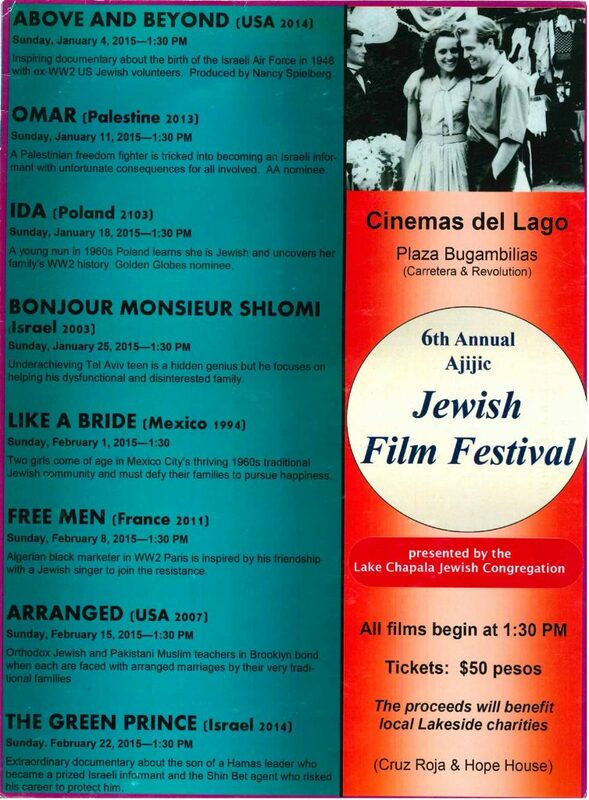 The 6th Annual Ajijic Jewish Film Festival takes over the movie screen at Cinemas del Lago in Bugambilias Mall at 1:30 pm, every Sunday during January and February. The committee screened over 50 films to create an exciting playlist that will take attdees from 1948 Palestine to the West Bank today, by way of Poland, Tel Aviv and Mexico City in the 1960’s, on to wartime Parish, modern Brooklyn and finally back to the West Bank. The film program includes Oscar and Golden Globes nominees, awards of the Israeli Film Academy, Mexican Ariel winners, special awards from Cannes and Sundance and some films that are too new for awards nods. The festival is sponsored by the Lake Chapala Jewish Congregation with net proceeds benefiting Lakeside charities. Sunday, January 4: “Above and Beyond.”(United States, 2014) The first major feature-length documentary about the foreign airmen in the 1948 Arab-Israili War. Sunday, January 11: “Omar.” (Palestine, 2013) A young Palestinian freedom fighter agrees to work as an informant after he’s tricked into an admission of guilt by association in the wake of an Israil soldiers killing. Sunday, January18: “Ida” (Poland, 2012) Anna, a young novitiate nun in 1960s Poland, is on the verge of taking her vows when she discovers a dark family secret dating back to the years of the Nazi occupation. Sunday, January 25: “Bonjour Monsieur Shiomi” (Israel, 2003) A new math teacher and new school principal discover a 16-year-old underachiever who is failing classes is really a genious.